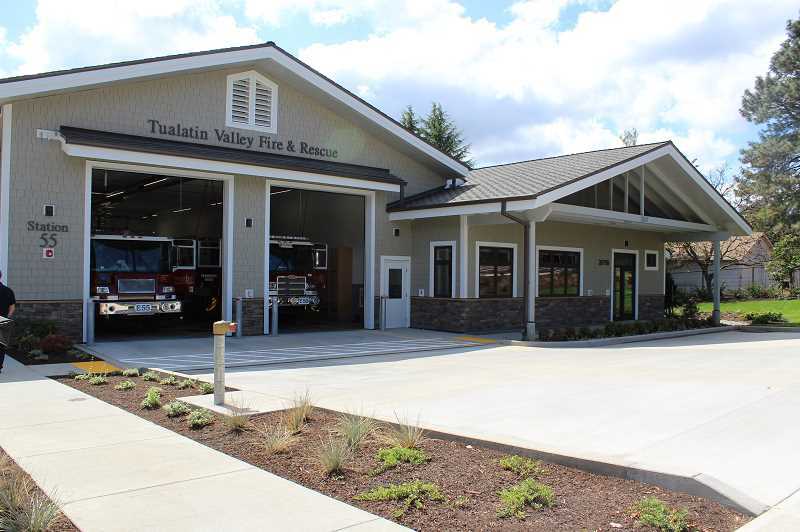 As he sat down to discuss Tualatin Valley Fire & Rescue's new Rosemont Station 55, TVFR Captain Todd Lake had just returned from leading his three-person crew on an emergency call. In the midst of an exceptionally dry and flammable summer, it didn't take long at all for the new $6.5 million station on Hidden Springs Road to be called into action after the crew officially moved in Aug. 20. Boasting a tiller truck — a larger vehicle that carries an aerial ladder and has two separate steering wheels in the front and back of the vehicle to improve maneuverability — as well as a standard fire engine, the station is equipped to handle a wide array of calls in an area that was identified as a priority for future service. 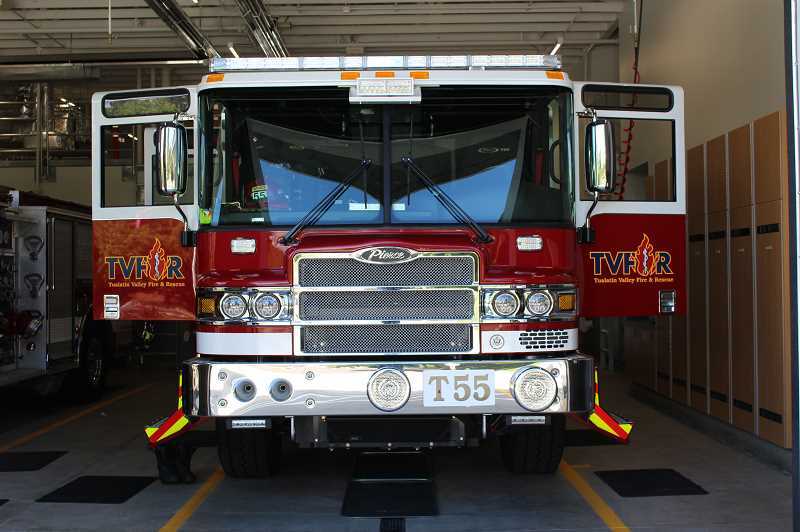 "We've actually identified, in the last 10 years, different parts of the district that would benefit from having additional infrastructure," TVFR Public Information Officer Cassandra Ulven said. "By having a station here, not only does it service the calls that are on top of the hill, it strengthens the response network on this side of the district." 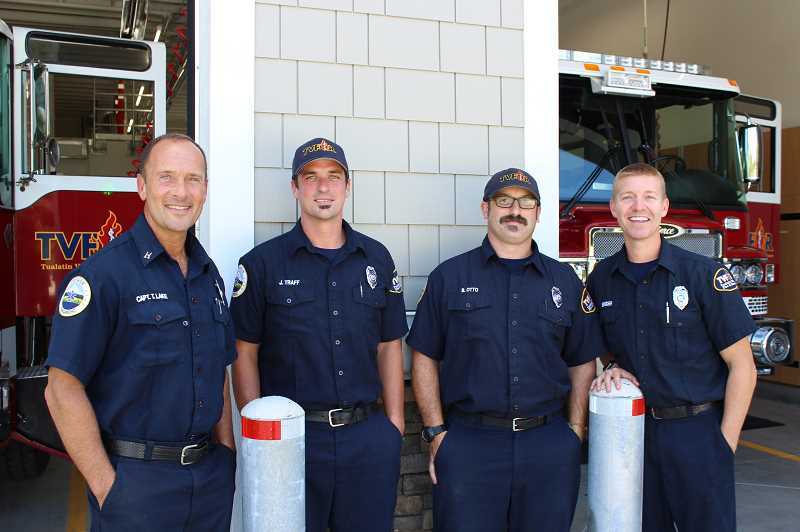 Station 55, which broke ground in May, is the third fire station in West Linn, joining Station 58 in the Bolton neighborhood and Station 59 in Willamette (both of which were replaced within the last decade). The main attraction is the aforementioned tiller truck, which is the first of its kind in West Linn, and one of six across the TVFR district. "Clackamas County Fire District and Lake Oswego have the two closest (tiller) trucks, and Clackamas moved one of their trucks further out, so it's that much better that we have a truck here," Ulven said. "And a truck performs different operations on a fireground than other apparatuses do." Specifically, the tiller truck and its ladder provide for significantly improved access in certain situations. Just recently, the tiller truck was called to a brush fire in the woods near West Linn High School to help firefighters access the area. "Crews had a difficult time accessing the seed of where the fire was due to the large amount of poison oak and other conditions that limited their ability to stretch hand lines into that area," Lake said. "So they had requested the truck come down and set up this aerial (access), and we had another engine supply us water, and we were able to reach into the location that wasn't accessed by ground and put out the seed of the fire. "That was one prime example of the effectiveness of having a truck in this area." The station also boasts a new community room, which will open to the public in mid-September once TVFR is fully moved in. "It's a good resource for neighborhood associations and other community groups," Ulven said. The tentative plan is to hold an open house at Station 55 Oct. 6, and the station will also play host to the annual 9/11 memorial event organized by resident Dean Suhr. To learn more about the station, visit https://www.tvfr.com/index.aspx?NID=303.